Fur trade employee GARTH CAMERON is charged with taking ILONA BAPTISTE—a lovely and much-desired Métis maiden who could become the catalyst for a bloody trade war between his own North-West Company and the more powerful Hudson’s Bay Company—to a place of safety down-river from the Rocky Mountain House trading post. The journey is barely begun when the girl is shot, apparently by enemy Cree, then somehow rescued by the brutal H.B.C. woods boss LOUIS SAVARD, who has claimed her. Garth is accused of having abandoned her. Savard falls out with is own people and flees, taking Ilona with him and leading Garth on a pursuit through hostile, trackless wilderness, north along the foothills of the Rocky Mountains. 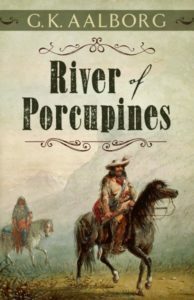 Ilona must face the perils of Savard and his half-breed henchmen, Indian attacks, capture and escape and recapture, and, when Garth and Savard meet in battle near the mighty falls of the Kakwa (Porcupine) River, her worst of all possible fates seems assured before she manages her own escape and—eventually—Garth’s rescue from near death. Believing Savard to be dead, they make their return to Rocky Mountain House, only to find their feelings for each other tainted by Ilona’s unplanned pregnancy and unexpected complications. When Savard returns as if from the dead, heading an Indian uprising that threatens Rocky Mountain House, it falls to Garth Cameron to fight and finally conquer the evil menace that has threatened both their lives for so long.